Mon to Sat – Lunches 11:30am to 3pm. High quality provenance focussed food & drink at affordable prices. Unfortunately our experience wasn’t very positive. The starter that arrived for my wife was wrong and by the time it came I had finished mine. The waitress had no knowledge of the menu and couldn’t explain what items were eg. Steak tartare. The salad was simply lettuce leaves, the risotto was sloppy and bland. Overall we felt that the food was expensive. Staff very attentive. Food above average. Nice evening out with good food. 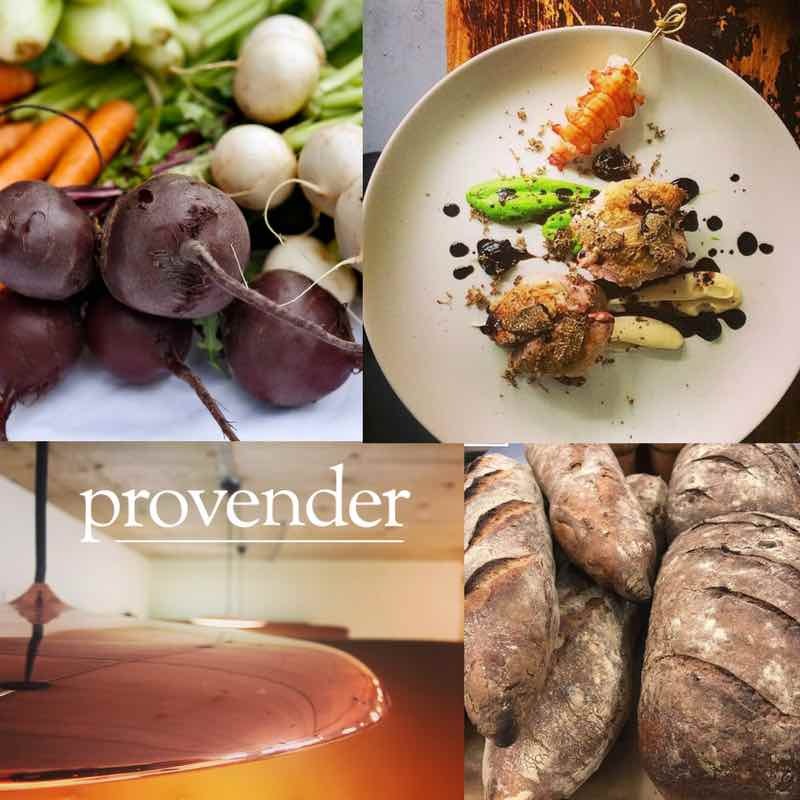 We had a brilliant experience at Provender, from the complimentary fizz to celebrate our engagement to the excellent service from our waiter. The food was amazing and the atmosphere was just perfect. Lovely food, quick friendly service. There’s a children’s menu which my daughter loves but what might be a bonus would be colouring sheets or something to that effect for little ones. Had another great night at the Provender, fantastic food, attentive, friendly and accommodating staff. Have, and do recommend to others. We visited for lunch unfortunately the restaurant was quite therefore lacked in atmosphere. The decor is lovely and the choice of music was appropriate and not to loud. One of our company if a stickler for a warm plate and this was one of her criticisms. Personally I really enjoyed what I had the pesto with the baked cheese was delicious and the lemon salad dressing I will definitely be back to buy some. I would say my main course Baked cod could have been warmed and I was a little disappointed that there was no crab available as advertised on the menu . The staff were very attentive, gave us time and did not rush us. We did all comment that one staff member was slightly over the top and maybe trying to hard to impress.Otherwise all very nice and accommodating. We were pleasantly happy and enjoyed our afternoon. From entering the restaurant, we were welcomed and service was first class. Will definitely return on our next visit to Melrose. Good menu and well presented food. Service was friendly and very efficient. Compliments to the chefs , and front of house .We had a very enjoyable evening and definitely will be back again .Many thanks . High quality food, lovely relaxing atmosphere, service excellent. everything about this dining experience was good! we'll be back. Having eaten with you previously I booked the table for my son and daughter in law as a treat. They had a wonderful evening and couldn’t have enjoyed the meal or service any more. We would certainly recommend you to friends. Really excellent food and service, we will definitely be back. From steak to scallops, all was perfectly prepared and presented.